Acer A13-045N2A replacement laptop Power Adapter for ACER Aspire ES1-411-C3W3 ES1-512-C8JU . 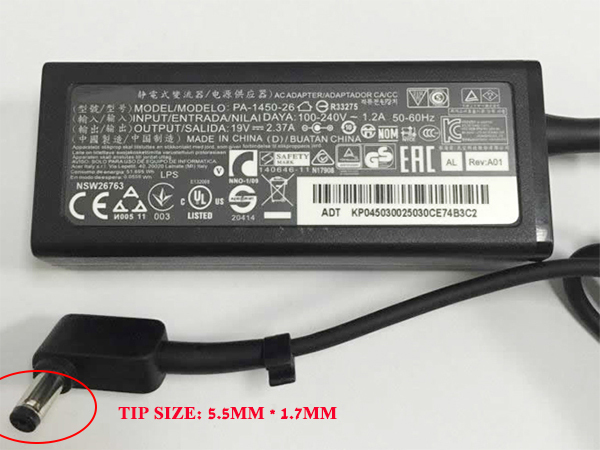 Buy cheap laptop Power Adapters, A13-045N2A laptop Power Adapter with low price and high quality!This GSB277 Acer A13-045N2A meet or exceed the original laptop Power Adapter specifications. Acer Aspire E5-422, E5-422G, E5-473, E5-473G, E5-522, E5-522G, E5-532, E5-532G, E5-532T, E5-573, E5-573G, E5-573T, E5-573TG, E5-721, E5-722, E5-722G, E5-731, E5-731G, E5-771, E5-771G, ES1-111, ES1-111M, ES1-131, ES1-311, ES1-331, ES1-411, ES1-420, ES1-421, ES1-431, ES1-512, ES1-531, ES1-711, ES1-711G, ES1-731, ES1-731G, R3-131T, V3-574, V3-574G, V3-574T, V3-574TG, Z1-611.